Editor’s Note: I had dreamed all my life of a daughter named Kaitlyn. Even after my dream faded away — through a miscarriage, bad advice and self-defeat — Kaitlyn fought her way into existence. This is my true story of love, life and motherhood. When I was 20 years old, I was told I might never be able to have children. My pounding heart drowned out the doctor’s voice. I collapsed to the floor. I hugged my knees close to my chest and swayed side to side, gasping for breath. It felt like someone had just revealed to me that my whole life was a lie. My entire reason for living was based on the belief that I would one day mother a mini-me. The tears continued to fall even when it seemed my eyes had swollen shut. I was dead inside. Four years later, we had our second baby at Eden Medical Center. But it wasn’t Kaitlyn. It was Pedro, for whom I was thankful. He’d be Kaitlyn’s big brother one day. As the oldest of all the girls in my family, I’d always wanted an older brother. I imagined every girl did. With Pedro’s birth, I felt blessed and empowered. My heart healed completely on the day he was born. I could now laugh with friends about my meltdown in the doctor’s office all those years ago. But if jinxing were real, that’s what I’d done to myself. A year later, I found myself reliving it all over again. Three months into my third pregnancy, I was sure this baby would be my long-awaited daughter, Kaitlyn. But it wasn’t the case. This time, while three months pregnant, I had my second meltdown — in my bathtub. I cried as a flood of blood clots the size of livers escaped from my body. I was losing Kaitlyn. My five-year-old, Antonio, found me hysterical in the bathtub, gathering the clots as I screamed out Kaitlyn’s name. Antonio called out for his dad, who had just returned home from a trip abroad. He had come back early to celebrate my pregnancy, which I had told him about while he was away. The bleeding continued as I was rushed to Eden Hospital. Nurses prepared me for surgery and a blood transfusion. In the care of excellent surgeons, I narrowly escaped the transfusion. “I’m sorry Kaitlyn died, Mommy,” Antonio whimpered when I arrived home. “Don’t you EVER say that again!” I screamed. I didn’t know if I had been carrying a boy or a girl. It was just my baby. It was difficult figuring out how to mourn the death of one child while celebrating the lives of my other two. Friends and family knew about my daughter, Kaitlyn. Though imaginary, she had become a very real part of our lives. Antonio, Pedro and I did a mural-style painting in our laundry room. On one wall, we painted a tree with the names of our family, including our extended family and all the pets we’d owned. Another wall had large stenciled letters that spelled out the names of our immediate family. It included Kaitlyn’s name. The murals remained for two years. Last year, at age 36, I felt the wrath of our fallen economy as did so many others. I was convinced that I would be too old by the time I felt financially stable enough to try for my last baby. I told myself that it was time to stop dreaming. I got some paint and a roller and painted over Kaitlyn’s stenciled name on the wall. Then, onto the floor I went. For the third time, I was completely broken over the loss of a child whom I so desperately wanted and thought I’d never have. When I finally picked myself up off the floor, I went looking for the positive pregnancy test that I had kept from my pregnancy with Antonio. I thought seeing it might help me feel better. I didn’t remember there being another unused test in the pouch, but there was. I can’t tell you why I took the unused test, since I was not trying to get pregnant. The result was positive. Needing real confirmation, I went to the doctor’s office the next day. 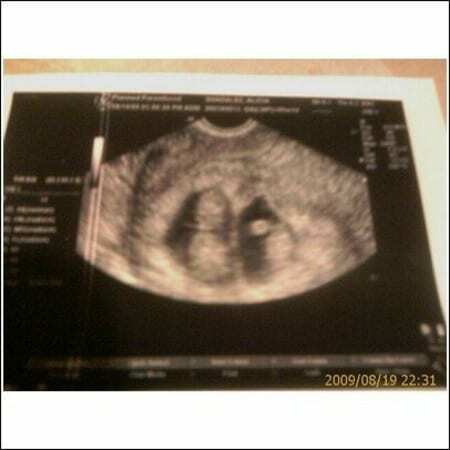 I was told that I was seven weeks pregnant, with twins. When I saw the ultrasound picture, something about it seemed strange to me. There was a small line separating the two sacs, but one sac looked much bigger. I was pregnant not with twins, but with triplets! Within days, another doctor confirmed my theory. Ugh! How could I be expected to just pick a baby? “NO! NO! NO! No, thank you!” I shouted. I felt like the counselor was urging me to do it. I didn’t want to mess with fate. However, out of anger and curiosity, I was compelled to ask which baby would be reduced, had I agreed to the procedure. “Baby C. The one in its own sac,” the counselor responded. “I was just answering your question,” he muttered. It was a difficult pregnancy. Six months into it, one of my water sacs broke. 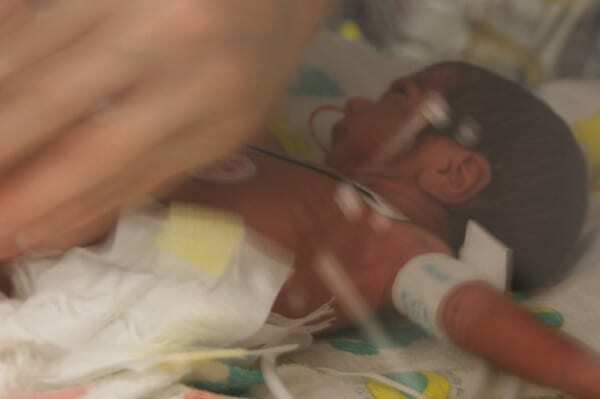 Within days, I delivered all three babies, each weighing in at just over two-and-a-half pounds. Baby A, Enrique. 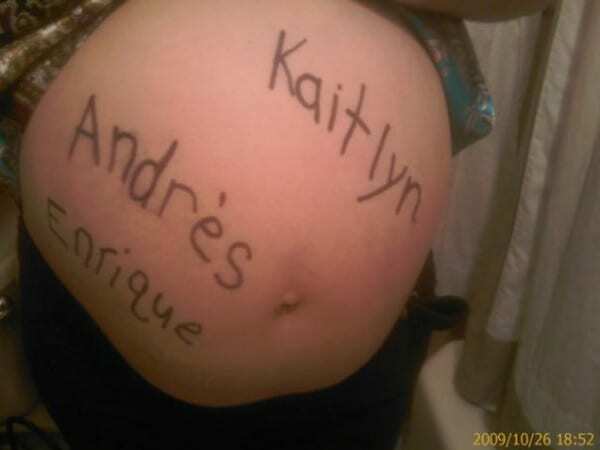 Baby B, Andres. Then, Baby C, Kaitlyn, the last baby I would have. Sometimes, a dream is so destined to come true that it holds onto us long after we have let go of it. From a family of two, we grew to four and then we became seven. Both literally and figuratively, I became, 24/7 Modern Mom™. At this point, the Doctor thought there were two babies. I took one look at this and knew, there were three. Beautiful story! I myself am waiting on a Sofia or Emily. However she sees fit to come into our lives, via birth or adoption, I remain ever certain she will arrive. Thanks for sharing! I love the name of your blog! What an amazing outlook, “On Loan From Heaven!” So true. Thank you for stopping by.